ChemSee offers several unique detectors for common explosives and explosive precursors. All detectors use a simple color change to identify the presence of explosives on a surface or in a solution. They are simple-to-use, even for unskilled personnel and can easily carried in the field. *If product is refridgerated during storage. Detection of Organic Nitrates (e.g. nitroglycerin, PETN), Nitramines (e.g. HMX, RDX) and Inorganic Nitrates (Z-Pad Only, e.g. Ammonium Nitrate). Detection of Inorganic Nitrates (e.g. Ammonium Nitrate, Potassium Nitrate) on smooth and rough surfaces. Clean water provided for testing. Detection of Flammables (e.g. Acetone, Gasoline) and Strong Oxidizers (e.g. Hydrogen Peroxide). Detection of Strong Oxidizers in Gels and Thick Liquids (e.g. Hydrogen Peroxide in Hair Gels). Detection of Strong Acids (e.g. 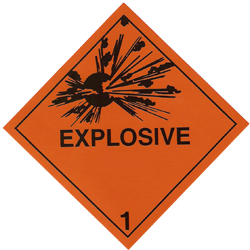 Sulfuric Acid), a component in many home-made explosives.